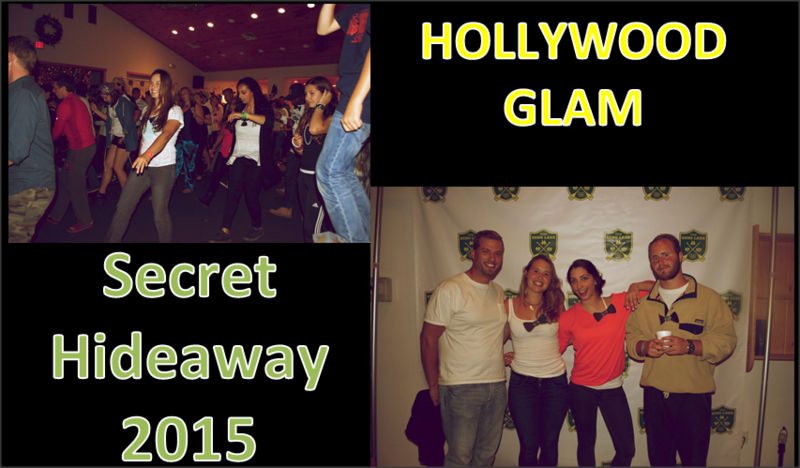 Secret Hideaway 2015: “Hollywood Glam” Theme a Smashing Success! One of the highlights of every Upper Villager’s summer is the opportunity to plan and host Secret Hideaway – the social event of the season for the Camp Echo Lake staff, which also happens to raise money for a great cause (Project Morry). This summer’s theme was “Hollywood Glam.” Based on the energy in the room and the funds raised ($4,062.50), the event was a smashing success! Throughout the day leading up to the event, the enthusiastic and purpose-driven Upper Villagers tirelessly worked together as a team to turn The Lodge into a glamorous night club. The doors to The Lodge were blacked out as the room was being staged, creating an insatiable curiosity for younger campers hoping to sneak a peek at the transformation for the exclusive event. Following Friday Night Live, the Upper Villagers added finishing touches to The Lodge before the guests started to arrive. With only a nominal difference to attend the event as a VIP, most guests chose to do so, arriving in style in a Camp Echo Lake stretch limo (decorated golf cart). Adorned in hand-crafted “VIP” bow ties, the guests filed into the dimly-lit club. The room was alive as energetic music filled the air, courtesy of the Upper Village DJs. Aside from all of the fun that the staff was clearly having, the thing that stood out most was the pride that each Upper Villager displayed in their respective roles. Each one played a part in putting on a memorable event that ran very smoothly. The one minor malfunction that arose was met with quick thinking and poise in the face of adversity. When the blender that the bartenders were using to make smoothies stopped working, they literally turned lemons into lemonade to keep the drinks flowing. It isn’t often that so many staff members are all gathered in a social situation because their time is dedicated to their campers. And yet, the bonds that the staff displayed throughout the evening was something to behold, particularly on the dance floor as they participated in group dances with smiles as far as the eye can see. Beyond the dance floor, which was packed throughout the evening, the staff fully immersed themselves in all aspects of Secret Hideaway, purchasing numerous products at the bake sale, participating in raffles and silent auctions for unique Camp Echo Lake art creations and actively bidding during the live auction portion of the event. Secret Hideaway is about more than just a fun evening to show appreciation for the staff. It’s also about giving back, something that the winners of the baked goods auction items demonstrated as they shared cupcakes amongst their peers. The live auction had genuine excitement, suspense and an interesting twist. Unlike other auctions, Secret Hideaway did not feature a neutral host, which explains why Jon “JOB” O’Brien (Senior Village Boys Head Counselor), jumped into the bidding even though he was the auctioneer. After the staff departed, the Upper Villagers stayed behind to revel in the moment and to clean up after the event. They were rewarded with an extra hour of sleep the following day, but the real reward came in the form of pride for taking on a great deal of responsibility, putting on an outstanding event and doing good for others. Camp is filled with moments of pure joy, and Secret Hideaway was definitely one of them for all in attendance, especially the Upper Villagers who will always cherish the memory of the event and what they accomplished together as a team.